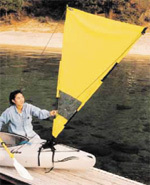 Specially designed for kayaks, this sail is easy to set up, take down, and store. Deck rigging #75-0180 is required. Works best with retractable rudder. Flush mount rod holder with hardware and end cap. Attach to top deck for quick storage of paddles. This 3 lb. 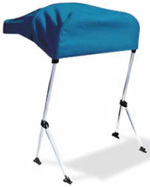 anchor folds and unfolds in seconds and takes little space for storage. Provides shade from the sun and shelter from the rain. This bungee cord under tension lets you keep necessities in easy reach on your kayak’s deck.